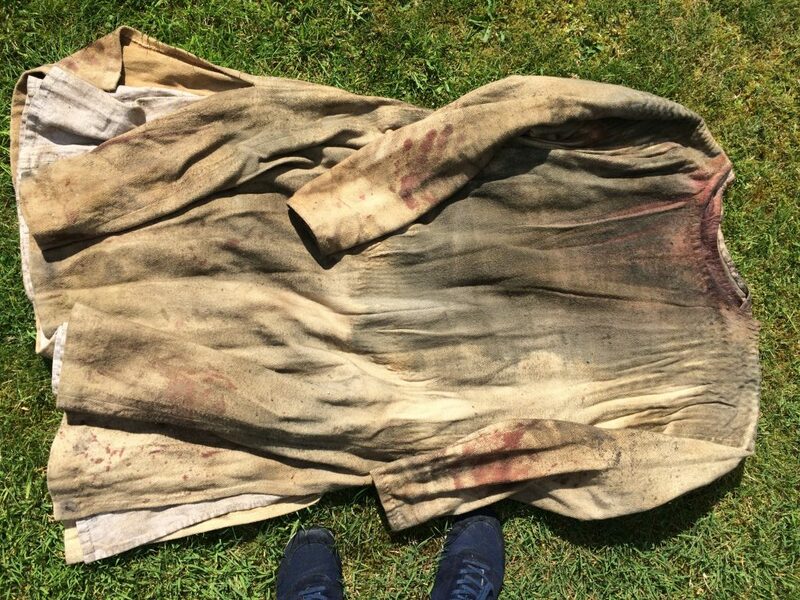 Breaking down fabrics, or artificially ageing them, is often part and parcel of creating costume for film or theatre. 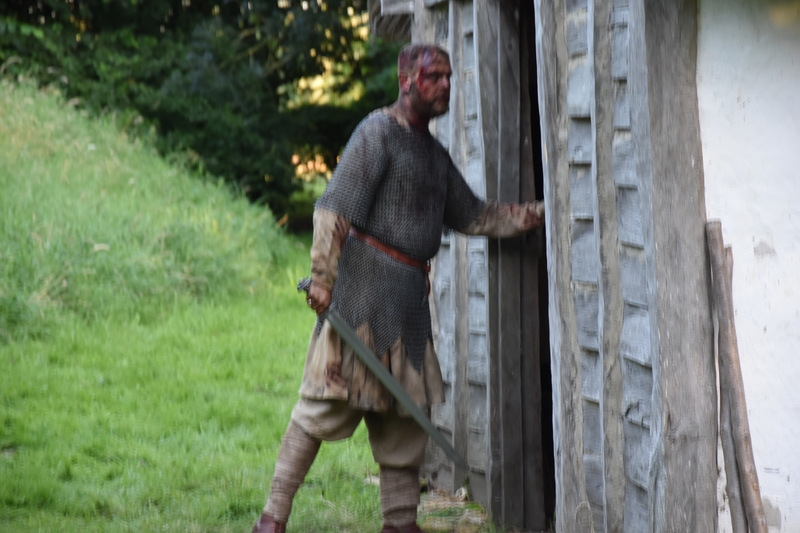 I recently created Anglo-Saxon clothing for a short film, made by Urban Apache Films, which needed to be bloodied and muddied as though straight after battle. However, I wanted to retain the integrity of the costume so I didn’t use any of the tearing, slashing or grating that I might also employ! I began by dipping all the completed garments in a weak solution of potassium permanganate. 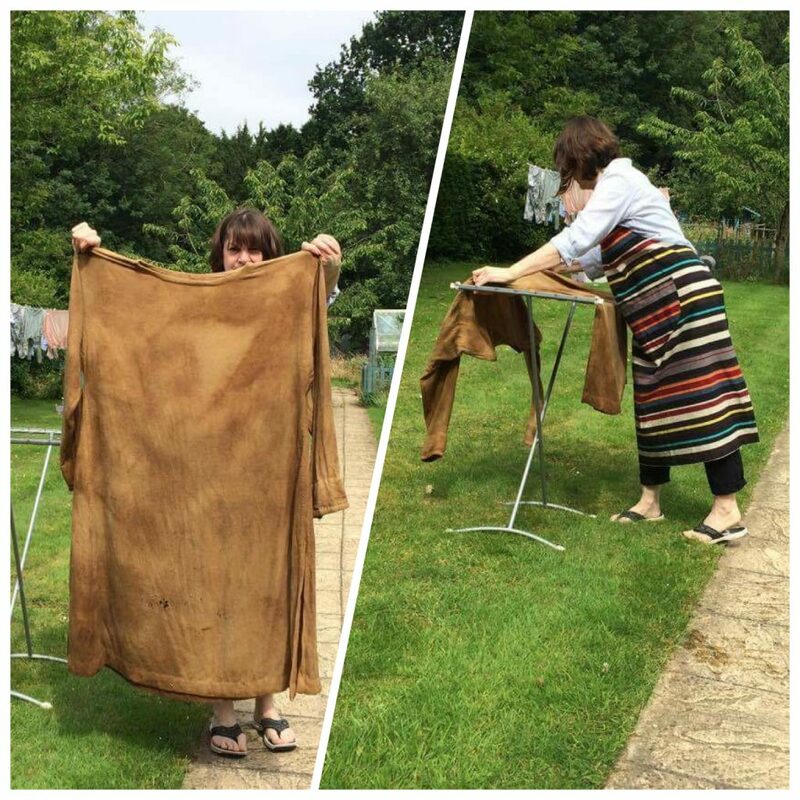 Potassium permanganate creates a purple solution, but, as the garments are lifted out and exposed to the air, the solution oxidises and turns rusty brown. Each different fabric took the stain differently and irregularly. It also serves to soften and age the feel of a textile. Please take care when using this agent though, wear a mask and goggles, gloves and overall when handling the powder. I also used various colours of ‘Dirty Down’ spray to layer up the dirt and stain and finally we added plenty of real mud and fake blood! 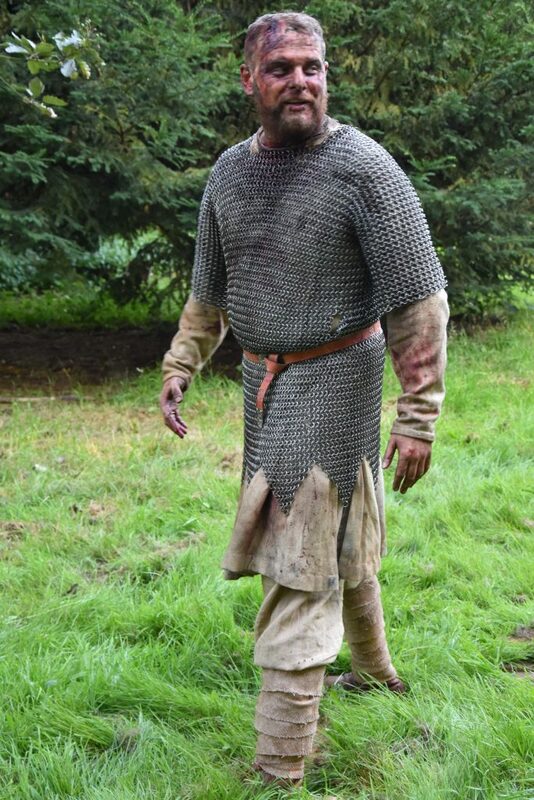 One tip: when looking after an actor wearing chain mail – do make sure to keep them warm as the mail draws the heat from the body, especially if the actor is wet as part of the process of filming. 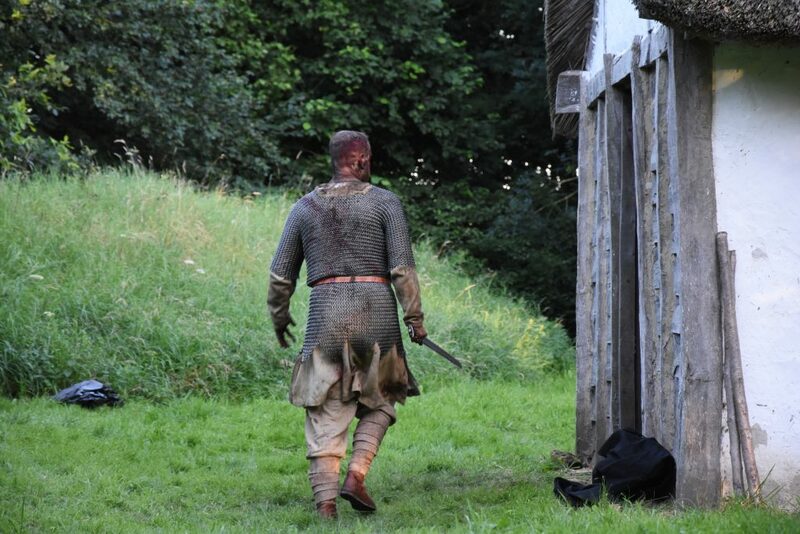 Welcome to my blog; it's mostly about the period costume I research and make, but will also occasionally include stories from filmmaking and pieces on locations that we have filmed in. (c) Pauline Loven 2000-2018 (except where otherwise indicated). This website, and the photographs and text on it, are copyright works under the UK Copyright, Designs and Patents Act 1988. They are protected internationally under the Berne Convention. They may not be reproduced in any form or incorporated in any other website or other electronic medium without the written permission of the copyright owner. The moral rights under Sections 77-89 of the UK Copyright, Designs and Patents Act 1988 of the author(s) of the works in this website are hereby asserted. Please contact Pauline Loven for permission to use any of the images on the web site. ‘Getting Dressed in the 18th Century – The Busk’. (c) Pauline Loven 2000-2017 (except where otherwise indicated). This website, and the photographs and text on it, are copyright works under the UK Copyright, Designs and Patents Act 1988. They are protected internationally under the Berne Convention. They may not be reproduced in any form or incorporated in any other website or other electronic medium without the written permission of the copyright owner. The moral rights under Sections 77-89 of the UK Copyright, Designs and Patents Act 1988 of the author(s) of the works in this website are hereby asserted. Please contact Pauline Loven for permission to use any of the images on the web site.